RV camping is great, but a loud generator can quickly turn a fun trip into an argument with the campers all around you. I found a few tips and tricks to help quiet your RV generator. How to quiet my RV generator? There are many options when it comes to quieting your generator, here are a few ways ranked by cost. These are a few options when it comes to making your generator a little quieter. If you are looking for a little more detail take a look below!! Probably the best option for reducing the sound of a portable generator is to simply create a noise reduction box. Your average (old school RV generator will run close to 80 decibels while it is in use. That wasn’t a problem until all the guys around you upgraded to those quiet (probably eco-friendly) generators. Those “quiet” generators run anywhere from 50-60 decibels. Probably the cheapest of the options is the noise reduction box. It is as simple as it sounds. 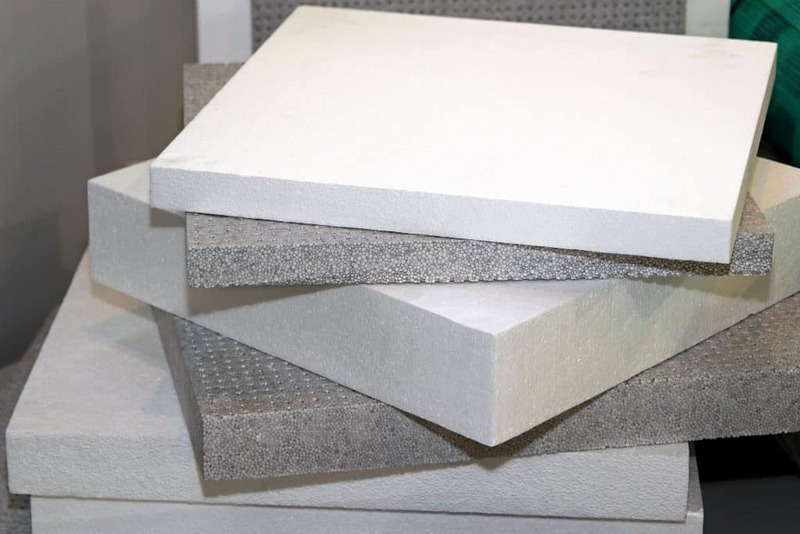 You can buy noise reduction panels made of foam that will reduce the sound so much! Personally, I would suggest starting by building a fiberglass box. You want to make sure that it is larger than the generator itself so it has space to breathe (the generator needs to have enough air intake for the engine to run). After you build this first box, cover the inside walls with noise reduction foam. Adding this extra layer will keep the sound contained. 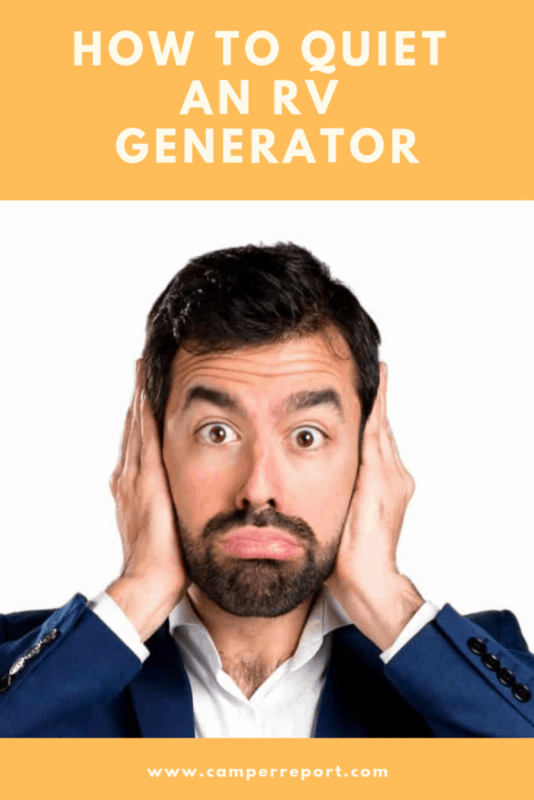 Even though this is one of the cheapest, most effective ways to silence your generator, you will still be investing over $100 as well as hours of your personal time. Adding a muffler onto your generator may seem like a task that is a little overwhelming. While it definitely will take some time and skill, the result can be really impressive. On average, adding a muffler to your generator can reduce the noise output by 10-15 decibels! That is huge! One of the first things that you will want to do is research the type of muffler that you would like to add on to your generator. Here is the cool part. There are special mufflers designed just for a generator BUT you can add on any car muffler to your generator. After you have chosen the muffler that suits you the best, you will need to decide if you want to weld the muffler on or if you will want to use some clamps and flex tubing. If you have the skill to weld the piping of the muffler on then that creates more of a sound barrier. The amount of noise that will be reduced will be more than if you use the method of clamps and flex tubing. Be careful during this process, if you want some further ideas for welding, you can check out this video on youtube. If you are anything like me, you don’t know how to weld but you still need your generator to be quiet. The second way that you can add a muffler onto your generator is by getting some metal flex pipe and your muffler and attaching the tubing together with the flex pipe and clamps. This method is not as effective as welding but it still will help. Always be safe and make sure that the muffler that you are using allows for the exhaust to escape. When the exhaust becomes trapped it can increase the potential of fire and the possibility of ruining your machine. Each camper and RV is different, therefore you may or may not have an onboard generator compartment. 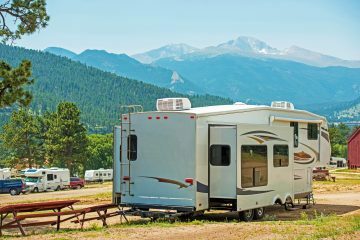 You might have a spot to mount a generator on the exterior of your RV, or there might be no space for it until you park and put it underneath. For those of you who do have a compartment to put your generator, this is for you. Depending on the age (year) of your RV the compartment designed for a generator might be soundproofed and there is a chance that the older makes and models are not soundproofed. There are really two ways to find out. If you have an owners manual, read up on the storage areas to find out the specifications and other details. If there is no owners manual any more then you can open up the compartment and see what you can see. Tap on the walls to feel what they are made out of. If they are made out of a softer, malleable material there is a good chance that this has been soundproofed. If the shell of the compartment feels like metal or a hard plastic then there can be 2 things happening. 2. The soundproof material is on the other side of the plastic. When you have tried these things but you are still wondering you can always purchase a decibel reader, turn on your generator in the compartment and listen to see how loud it is. Use the reader to see the decibel output. Soundproofing your onboard box will be pretty similar to how you would build a soundproof box. You will want to take into acout the need for a lot of air flow. Depending on how much space you have ou will want to invest in some sound reducing fiberglass board, some sound panels, ect. The more layers you can add, the quieter your generater will sound. 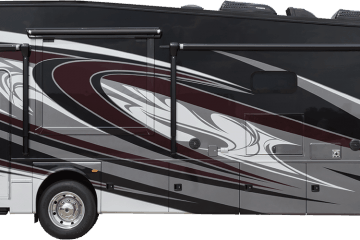 The most important thing to keep in mind is that by altering the RV you may void any warranties that you have covering it. Make sure before you alter anything that you check the warranty policies. No warranty? No problem, you can get right to work. I know, I know, you read this heading and chills ran up your spine and you broke out in a cold sweat. Yeah, that is exactly how we all feel. Not because we don’t want a new generator, but simply because it costs so much. I found a few pros and cons to buying a new generator, I hope that they are at least a little bit informative for you. Let’s start with the pros. Of course, one pro of buying a new generator is the fact that you will have a brand new, quiet generator. Your generator cares will immediately go away. (Not as much might be said for your bank account.) A lot of us just don’t have the time for an RV overhaul, building boxes, soundproofing this and that. Home Depot, Lowes, Back to Home Depot….you get the picture. We are busy and all we want is to enjoy a getaway without any concerns. Especially concerns about the noise of our generator. If this describes you then you might think about investing in a generator. Time is money. Another pro of buying a new generator is it is a good, long term fix. If you buy now, you won’t have to buy again for a while. No generator repairs, no box repairs. It will be easy. Often when we embark on a DIY project we are doing to save ourselves some money. That is great! The only problem is we don’t know what we are doing, and we make mistakes. DIY equals time and money, mistakes equal extra time and extra money. You probably would budget a certain amount, and by the time you finish you will have exceeded that amount easily. When it is all said and done, you could have had a good down payment on a new generator. Just a thought. The most obvious pro of buying a new, quiet generator is that it is new and it is quiet! Many of the new generators that are hitting the market are very quiet compared to the older generator models. Even if you soundproofed your old generator from 85 decibels down to 70 decibels, that is still 70 decibels! The models that are known for their soft purr range from 50-60 decibels! That’s less noise than the kids make on a Saturday morning! It really is amazing how quiet these new generators are running. So there are a lot of pros to just biting the bullet and getting a new generator for your RV, but before you run out the door with the credit card lets talk about a few cons that may slow you down just a little bit. The first and most obvious downside (drum roll please) Yes, its the cost. Really the lowest price that you will find a halfway decent generator for is right around $1000 USD. Your higher-end RV generators are running from $2,500-$3,000 USD. If you looked at those numbers and you haven’t started sweating then maybe a DIY project might be in your near future. When you are thinking about buying a new generator you also should concider how much you will use your RV. If you only take it out 1 time a year, you can probably suffer from some noise pollution. On the other hand, if you go out camping most weekends in the summer, this investment could be worth your money. Looking for a new generator for the sake of peace and quiet is easy nowadays as many companies compete to make their products quiet and efficient. One company that has done this so well is Honda. Honda has made some of the quietest generators so far, but how? Honda introduced a new part to their new generators. It is called eco-throttle. Eco-throttle is designed of course to quiet the engine and it does this by monitoring the exact amount of output needed. This makes it so when there is less pull of electric current the engine will run at a lower, quieter level. When the pull increases it will once again meet the required output. These generators never constantly run at full speed. Honda generators are also made using special materials that have been found to further dampen the sound. There are a lots of ways that you can quiet down your generator but another option to a loud, smelly dirty generator is to go green!!! Recently there has been a wave on new generators that have hit the market. What makes them different from the other generators? They are solar powered! Imagine the cool mountain air, birds singing the mountain stream babbling down and its quiet, completely quiet. Except for the hum of your RV air conditioning and the tv set going to keep the kids entertained for a while. Wait!? Where is the roar of the generator? Oh yeah, you just bought the eco-friendly, silent solar powered generator. Did that make you feel good or what? These solar powered generators are great for your basic RV needs. They use the rays of the sun to store up power in lithium-ion battery cells to be used at any time! You can run them during the day while the panels are in the sun and then at night when you need power, it will be powered up and ready for your evening needs. You might be wondering if the Yeti 3000 is strong enough to power your RV. More than likely you will be fine as long as you aren’t running all of the appliances in your RV at once. If you do need to run a lot of things at the same time, many of the solar generators have the ability to chain together giving them more power and ability to output larger amounts of electricity. Solar is not for everyone, but if you really feel like making your carbon footprint a little smaller you should look into a solar generator. Solar generators can fulful most needs for an average person. Remember, solar is silent! Youv’e read all this info and now you might be wondering what you should do or mabe you have a direction you want to take. You are the master of your own ship. There isn’t one best option for everyone so what you choose to do is great! Good luck on your DIY’s and your future RV adventures! What are the Best Materials for Soundproofing? Materials with loosely packed fibers are the best for sound absorption, fiberglass board is also very effective. Foam is great for temperature control but is not the highest quality for keeping sound contained. How Can I soundproof a room for cheap? The cheapest option for soundproofing a room is to add additional rugs on the floor and by hanging blankets on the wall. Next step up, fiberglass or foam panels to deaden the sound.